Phool Makhana is a famous food in India especially during fasting, its also commonly known as lotus seed or fox nuts. 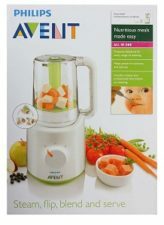 Its such a versatile food for babies and kids, ideal as a breakfast cereal or a snack! 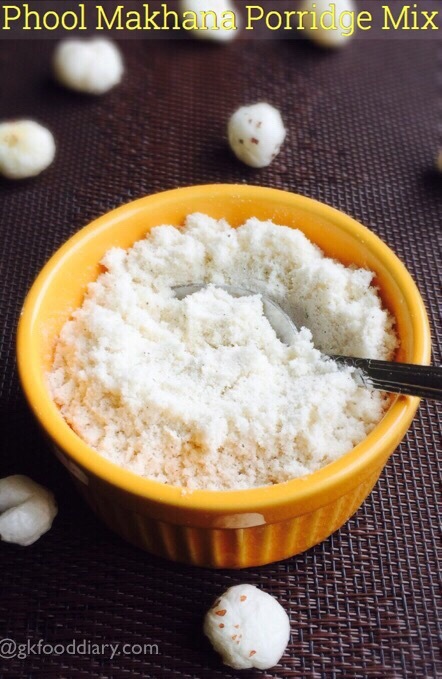 Phool makhana is produced from puffed lotus seeds after removing the bitter outer membrane. Phool makhana is an excellent source of protein which makes a light, healthy and easily digestible food for growing kids. This Phool makhana cereal is very easy to prepare at home, and you can make an instant porridge anytime with this mix, it is really helpful when traveling with infants as it requires no cooking. Read more about when and how to introduce Phool makhana to babies, health benefits. You can make instant Cerelac for your baby during travel, here is the detailed method of preparation of Phool makhana cerelac. 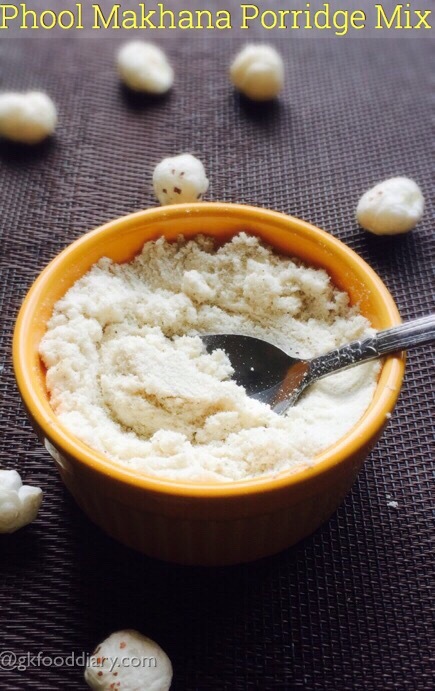 Add this Phool makhana cereal to milk and give as a breakfast cereal to your toddler. You can use this Phool makhana mix to make kheer. Now let’s get onto check how to make Phool makhana porridge recipe mix for babies & toddlers. Homemade Phool makhana Cereal Mix - cereal mix for babies with Phool makhana and roasted cashews. Measure Phool makhana and cashews. Take and Cut the phool Makana into two, check for warms if any. Cut and check for all the makhanas. Then dry roast the makhanas in a heavy bottomed pan until it turns crispy. 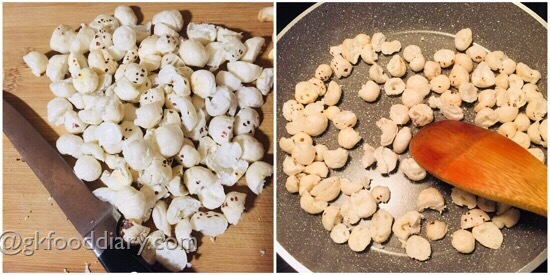 Take one roasted makhana, eat one & check whether its crispy and not chewy. Once the makhana is roasted well, remove it from the pan and switch off the flame. 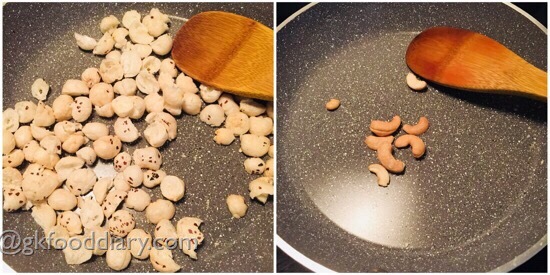 In the same pan, add cashews and roast it for 30 seconds. Remove from the pan and cool it down. Transfer the roasted Phool makhana, roasted cashews, and cardamom to a blender/mixer/food processor. Grind them to a smooth powder. Cool it down and store it in an airtight container. 1. Measure Phool makhana and cashews. Take and Cut the phool makhana into two, check for warms if any. 2. Cut and check for all the makhanas. Then dry roast the makhanas in a heavy bottomed pan until it turns crispy. 3. Take one roasted makhana, eat & check its crispy and not chewy. Once the makhana is roasted well, remove it from the pan and switch off the flame. 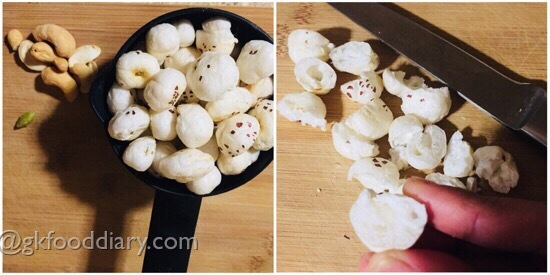 In the same pan, add cashews and roast it for 30 seconds. Remove from the pan and cool it down. 4. 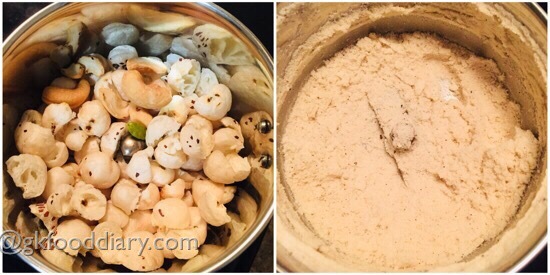 Transfer the roasted makhana, roasted cashews, and cardamom to a blender/mixer/food processor. Grind them to a smooth powder. Cool it down and store it in an airtight container. Healthy homemade Phool makhana porridge mix is ready! This Phool makhana cereal powder keeps well for two months if handled correctly. Cashews can be replaced with any nuts. Make sure that your baby is not allergic to nuts before adding. You can double the ingredients and make the recipe if you want to prepare large quantities. Clean the Phool makhana properly and remove warms(if any), before roasting. Adding cardamom powder to this porridge mix gives a subtle flavor. you can also add 1/4 tsp of cumin seeds instead of cardamom for a different flavor. 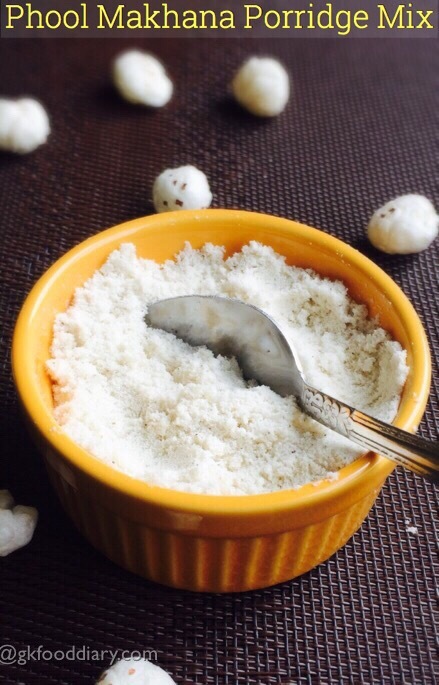 Store this Phool makhana powder in a cool and dry place. Keep it in the refrigerator if the temperature is extremely humid. Generally, Phool makhana doesn’t cause any allergies, but check for symptoms and stop feeding your baby if you find any.